Although he has only been in the game for about three years, Hush Hefner already managed to solidify himself among the household names of quality nightlife in Belgium. His recipe is plain but effective: combining his enthusiasm behind the decks with his unconditional love for dj-ing added up with a well appreciated and very versatile style of selecting and mixing jams. House, disco and funk are the cornerstones in a Hush Hefner set, but the man also likes to crossover to hip hop, classic soulful and R&B cuts and bass culture in general. 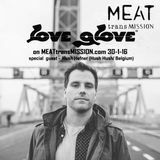 His signature blend brought him to some of the coolest clubs around the country, major festivals such as Tomorrowland, Extrema Outdoor Belgium and We Can Dance and a couple of legendary social visits at national radio station Studio Brussel. As of today double H&apos;s best form is still to come: a jam packed schedule including international dates, hosting Hush Hush and promoting Kleinhouse, and last but not least: a constant focus on the finest tunes.